Another week, another color crush! This week – a little bit early seeing as tomorrow is a holiday. This week’s mood board // color crush was inspired by the middle picture. Something about the ultra rich, royal blue with the lemon yellow and peachy salmon color immediately gripped me. 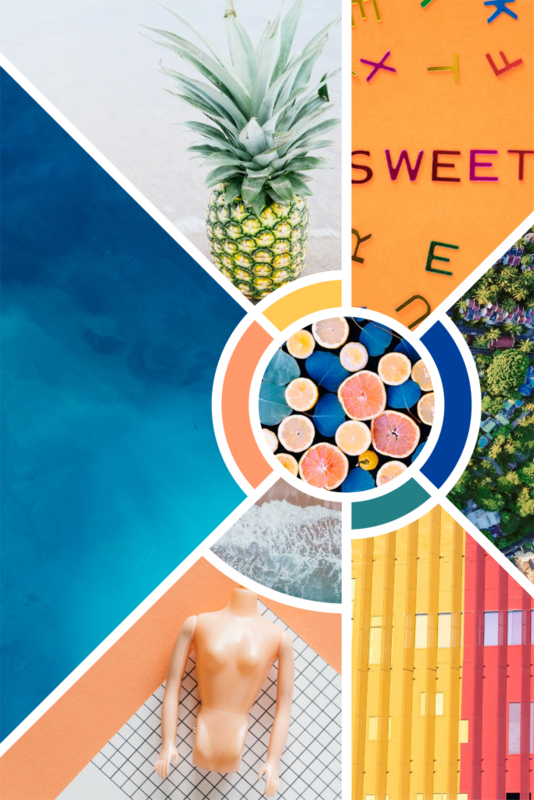 I went for a fun layout this week, the sections coming out of the center like sunbeams – perfect for this bright mood board. For imagery, I wanted something fun and funky… maybe even a little weird. A pineapple, a decapitated Barbie doll, a fun saying, all of it together goes for that beachy, summer vibe. PS – as always, the photos are taken from my favorite open source stock photo site – pexels.com.